The New Ceres planetary charter forbids the use of all modern technology. Law confines the people to the ways of 18th Century Earth. But beneath the surface, rebellion and revolution simmer constantly. Proctor George Gordon, a hidden protector of New Ceres, knows all too well how easily these can bubble over, but nothing can prepare him for interstellar warfare in his own technologically challenged backyard. What odd coincidence brings him to the Sunrise Isles to be confronted by ninja and warrior nuns? Who is the strange but compelling amnesiac girl he finds in the convent, and what do the offworld nations want with her? And how can he really be sure who to trust? 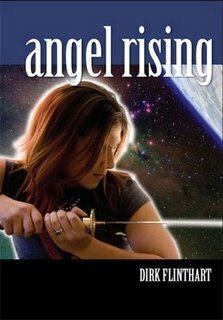 Angel Rising is a quick, invigorating read, with swordplay, technology and frock-coats. Dirk Flinthart’s writing is punchy, the action smoothly written and his characterization of George Gorden has left me wanting more stories with this protagonist. The story itself is a fascinating one, and highly enjoyable, but Gordon himself is the key drawcard. It’s somewhat amazing, but in 51 pages Flinthart manages to sketch Gordon’s character (it’s by no means necessary to read the first story) and also develop it.